Hypertension is increasingly being found in children and adolescents. The purpose of this study was to find out differences in the central arterial (aortic) blood pressure parameters in young adults with hypertensive and normotensive parents. 108 healthy volunteers in the age group of 17 and 25 years were enrolled for the study after taking consent. Brachial artery pressures and aortic parameters were recorded using PeriScope™ which determines aortic parameters and functional vascular age non-invasively based on oscillometric method. The results of this study showed no statistically significant difference between offspring of hypertensive and normotensive parents for both peripheral and central blood pressure parameters. Hypertension (HTN) is a multi-factorial disease with age as the major risk factor. Blood pressure increases with age in both men and women, and, in fact, the lifetime risk for hypertension is nearly 90%. The risk for high blood pressure increases in men over the age of 45 years and in women over the age 55 years. People with parents or other close relatives who have high blood pressure have an increased risk of developing hypertension. Hypertension is also becoming more common in children and teenagers. Among younger people, boys are at higher risk for high blood pressure than girls . Alterations in peripheral and central arterial pressures may be present in early life in normotensive children of hypertensive parents. Though the values may fall in normal range, but it may show a trend nearing the upper limit of normalcy. A recent study by Othman et al  showed that brachial systolic and diastolic pressures are higher in offspring of hypertensive parents compared to offspring of normotensive parents. Also there was higher central aortic systolic pressure in female offspring of hypertensive parents in comparison with normotensive parents. Rajzer et al  also showed that subjects with a family history of arterial hypertension had higher blood pressure levels (systolic and diastolic blood pressure, pulse pressure and mean arterial pressure) and there was a correlation between male gender and carotid-femoral pulse wave velocity. These findings also suggest influence of gender on different cardiovascular homeostatic mechanisms. In this study we hypothesized that children of hypertensive parents may have higher values of central blood pressure parameters even though the peripheral arterial pressures may be in normal range. With this hypothesis, we undertook the current study to find out differences in the central arterial blood pressure parameters in young adults with hypertensive and normotensive parents. This case-control study was conducted in the Department of Physiology of this college between April 2015 and September 2016 after approval from Institutional Review Board (Reference ID: 2015/8/007) and taking informed written consent from participants. 118 apparently healthy, MBBS student volunteers of this college were enrolled for the study. They were segregated into two groups. Group 1: Subjects with normotensive parents and Group 2: Subjects with hypertensive parent(s). Inclusion criteria for Group 1 was young normotensive individuals without history of diagnosis of hypertension in both parents while that for Group 2 was young normotensive individuals with history of diagnosis of hypertension in one or both parents. The parents may be on treatment and their present BP might be in normal range. Subjects with history of secondary hypertension; congenital or acquired cardio-vascular disease, respiratory and renal diseases which may be detrimental to blood pressure values were excluded. Weight, height, waist circumference and hip circumference were measured. Body mass index (BMI) and waist:hip ratio were calculated. The data was analysed using SPSS version 17.0. For analyzing the differences between the groups, t test and χ2 test was used. Two way multivariate analysis of covariance (MANCOVA) was also performed. Statistical significance was fixed at p<0.05. Subjects were between 17 and 25 years of age. Out of 118 subjects enrolled, 10 cases were excluded because of missing data and significant outliers. Hence, analysis was performed on the data from 108 subjects. Table 1 shows the differences between subjects with or without history of hypertension in parents. Data is expressed as mean ± standard deviation for scale variables and number (%) for categorical variables. The difference between the groups was determined by t-test and χ2 test for scale and categorical variables respectively. In Group 2, 85.7% subjects had history of hypertension in single parent while only 14.3% subjects had history of hypertension in both parents. 55.1% subjects in Group 2 had history of diabetes mellitus either in one or both parents while it was 33.9% in Group 1. There was statistically significant higher percentage of subjects with parental history of dyslipidemia in Group 2 than Group 1 (38.7% vs 8.5%, p=0.001). There were no statistically significant differences between the groups with respect to brachial artery pressures and aortic pressures. Aortic augmentation pressure (AoAugP) and augmentation index (AIx) was also not different in two groups (Table 1). The mean vascular age corresponded well with the mean chronological age of subjects (Group 1: p=0.308, Group 2: p=0.278). Gender does not seem to have significant bearing on the central (aortic) BP, augmentation pressure and estimated vascular age (Fig 1). Further, two-way multivariate analysis of covariance (MANCOVA) was done with aortic pressure parameters (AoSP, AoDP, AoPP, AoAugP, AIx, vascular age) as dependents variables; parental history of hypertension (No, Only father, Only mother, Both parents) and gender (Male, Female) as fixed independent variables; age, weight, height, brachial systolic and diastolic pressures as covariates in independent variables. There was no interaction effect (Pillai’s Trace=0.134, p=0.791) between gender and parental history of hypertension which means that the effect of the parental history of hypertension on the combined dependent variables is not different for males and females. However, main effect was significant for age, SBP and DBP (p=0.000). Hypertension (HTN), a non-communicable disease is a major risk factor of cardiovascular disease (CVD) morbidity and mortality. In present day times with highly competitive environments, individuals of all age groups are seeking healthcare for one or the other reasons. During workup many young individuals were found to be having raised blood pressures and have been attributed to changes in lifestyle, stress, etc. Studies point out that hypertension is occurring in late childhood and adolescence . One European study showed that the children of hypertensive parents had higher peripheral BP and pulse pressure on conventional BP measurement as well as on 24-hour ambulatory BP monitoring; also had raised central pulse pressure, peripheral augmentation index and central augmentation index compared with offspring of normotensive parents. They concluded that large-artery properties are altered in offspring of hypertensive parents compared with offspring of normotensive parents. However, the difference in peripheral augmentation and central augmentation indices were negligible after adjustment for age suggesting that the alterations in arterial function in subjects with a family history of hypertension is determined mainly by age-related hemodynamic changes . In the current study, there were subtle differences in the peripheral and central arterial pressure measurements between the groups but these were statistically not significant (Table 1). Our findings did not conform to the results of Othman et al , Rajzer et al  and Kucerová et al . Age as a covariate, in this study, showed significant main effect on combined central pressure parameters outcome. A longitudinal study indicated that parental hypertension has additive effects on age-dependent elevation of BP in both males and females and this may contribute to the increase in atherosclerotic cardiovascular events in subjects with a family history of hypertension . A French study showed that there is a relationship between parental history of hypertension under the age of 60 years and adult offspring’s hypertension status. This relationship depended on the number of hypertensive parents; the risk of hypertension increased when both parents were affected. Also, this relationship depended on the age at which hypertension had been diagnosed in parents . 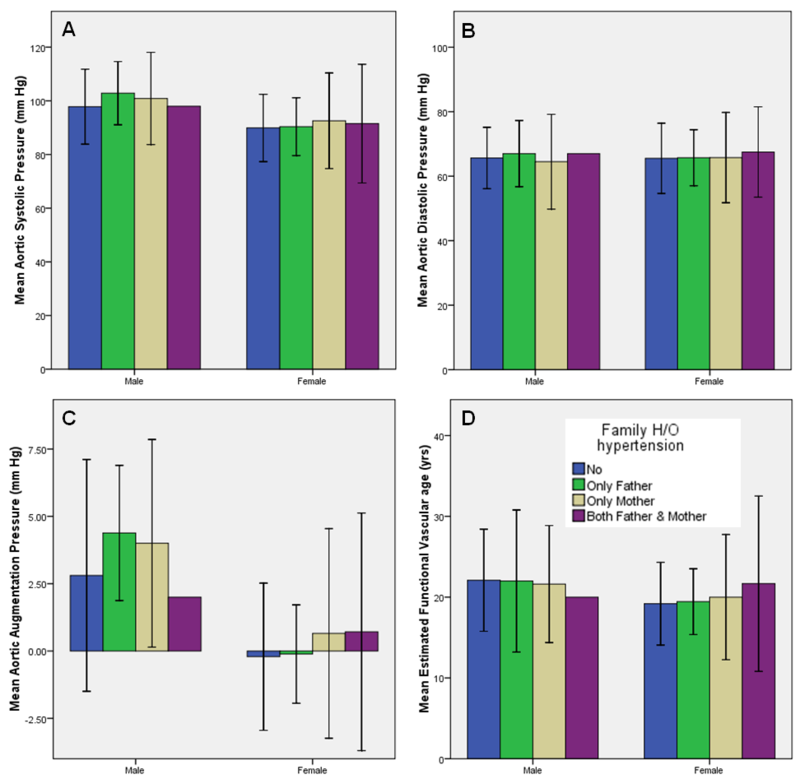 In the current study, multivariate analysis did not reveal any significant main effects of gender and parental history of hypertension alone and also no statistically significant interaction effect between the two. An interesting article on dietary habits showed that parental hypertension was associated with unhealthy dietary behaviors among offspring, including higher consumption of soft drinks and energy-dense, nutrient-poor foods which may also contribute to increased risk of developing hypertension . We conclude that there are no significant differences in peripheral (brachial) arterial pressures and central (aortic) pressures among normotensive young adults with or without parental history of hypertension. We are of the opinion that the parental age is also an important factor. Parents of some of the subjects were relatively young and hence normotensives where as parents of some subjects were older and had history of hypertension. This was the factor which could not be controlled in our study. We recommend that a longitudinal study design with follow up of parents as well as children over time may reveal better results. We also favor the proposition given by Kalbande and Anitha ; and Gopinath et al  that regular monitoring of BP in young adults with family history of hypertension be done to prevent future cardiovascular catastrophes especially when associated with other risk factors like increased BMI, increased waist:hip ratio, etc. Individuals with a family history of hypertension form an easily identifiable group who may benefit from targeted interventions . This study used PeriScope™ which was purchased under Indian Council of Medical Research (ICMR) extramural research grant (IRIS ID: 2012-0836) and partly supported by ICMR short term studentship (STS) programme (Reference ID: 2015-00527). Kalbande S, Anitha T. Monitoring of blood pressure of children of hypertensive parents in their early ages reduces the risk of having cardiovascular diseases in future: a study conducted on adolescents. J Life Sci. 2012 Jul; 4(1):35-8.